Martis Camp is a private community comprised of 2,177 acres located in Placer County, California. United States Postal Service mail will be delivered to the Camp Lodge. 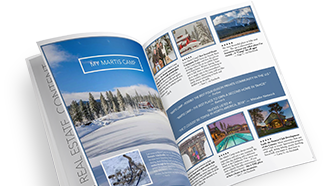 Members must activate their Martis Camp mailbox before receiving any mail from the United States Postal Service. If a mailbox is not activated, mail and parcels will be returned. To complete this process, please see or email the concierge team at concierge@martiscamp.com. Fed-Ex & UPS Delivery will be delivered to the home address or the gatehouse. NOT the Camp Lodge. Trying to send mail to the general Martis Camp address? Want To Refer a Friend or Neighbor?